First Light’s lamps for use in Fischer & Porter units are installed and effectively operating nationwide at large and small municipal water treatment sites. The First Light replacements offer site operators and managers a trouble free and cost effective alternative to the manufacturer’s lamp. 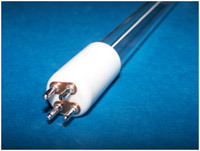 *Fischer & Porter does not sponsor, endorse or approve these or any other First Light Technologies, Inc. replacement lamp.